Writing letters to Santa is a Christmas tradition that is fun for both kids and adults. Australia Post helps to keep the magic alive by handling deliveries direct to the North Pole. 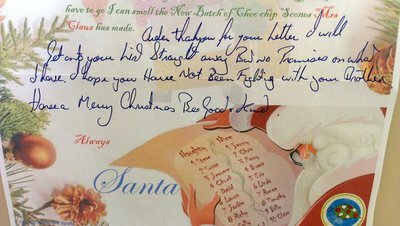 If you are on the nice list, you will get a personalised letter back from the jolly, old elf himself. Your letter can be whatever you want it to be. For the littlies, a drawing or even a simple collage will work. Mum or Dad can help with the writing if necessary. Last year, my 2 year old had a blast doodling and glittering. I helped him with the important parts (saying Thank you to Santa of course). My then six year old took such care with his writing as he knew that Santa was old and had bad eyes. Parents will often be surprised at the lovely sentiments that kids will include such as reminding Santa to look out for those less fortunate. You can also download Christmas themed letterhead from the Australia Post website to help you get started. Be sure to include a 60 cent stamp for postage. You must also include your return address on the back of the envelope to ensure Santa knows where to send his reply. You can post your letter over the counter or in any red Australia Post post-box. Some locations even have dedicated post boxes for Santa. Important: Post your letter by 16th December to ensure Santa has time to respond. Your child will receive a personalised letter from Santa. It's a great treat for kids to get mail addressed to them. Letters will generally include a brief message direct from Santa. Last year Santa reminded my son," I hope you have not been fighting with your brother". That reminder came in handy over the long Christmas break. - Check your mailbox for your reply. What a neat idea. Children are sure to get a real boost from getting a reply from Santa. My children did this a couple of years ago and the letters we received back were fantastic. Can't want to do it this year with my baby son!!! My 10 year old does this every year and still loves it.